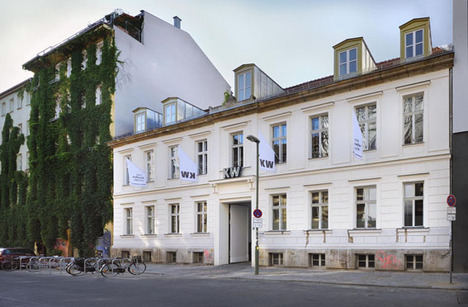 KW (KUNST-WERKE) Institute for Contemporary Art is located in the centre of Berlin. The tearing down of the Berlin Wall has brought many free spaces to the city, which inspired artists to gather and new galleries bristled. KW was established during this dawn of the Berlin contemporary art age, making a sudden debut into the world. 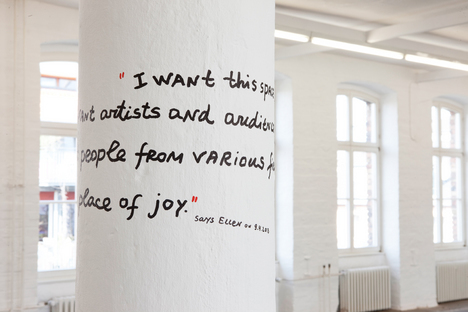 Since then, KW has been a leading art museum with great influence on the art scene of Berlin. And now KW is facing its biggest change as a new curator takes up the lead post. New programs are coming up including the first exhibition “RELAUNCH” to introduce a re-born KW, which provides people with the museum’s future direction. Before introducing the contents of “RELAUNCH,” let me explain some characteristics of KW. KW was established in 1992 as a private organization and has been hosting exhibitions with no restrictions like a public museum. Also, having no collection of its own enabled KW to adopt a modern-day sense and bring new ideas to the programs. KW is exactly the right place for art to reflect current society and culture. We can also deem this museum as the most important place for Berlin contemporary art as the main organizer for the Berlin Biennial. Having a great influence to the art scene, the direction of KW itself can be influenced by the curator. In 2013, Ellen Blumenstein took office and started bringing changes to KW. The“RELAUNCH” that Ellen planned has complicated the existing structure with several exhibitions and programs. But in a word, all of those are one big group to impress the notion of the “relaunch.” People who visited on the first day of “RELAUNCH” saw the empty building of KW with no furniture. The exhibition space has been refurbished and people noticed it as a “new place.” When they approached the white wall, tiny letters in contrast to vast space came into view. This artwork is by Bulgarian artist, Nedko Solakov and the memos takes up various topics from satirizing contemporary art to hinting at KW’s new programs. Nedko says he tried to depict the new curator’s vision for KW and the social reactions to it. His artwork emphasizes the empty building to depict renewal. KW has surprised the visitors and at the same time, convinced them of KW’s completely new style. 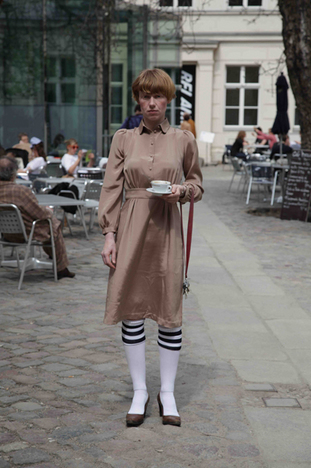 Walking around the empty building, the visitor will encounter a tall lady several times. The lady wanders the museum, pauses at the middle of the exhibition hall, and faces the visitors motionless as if she is a performer. This tall lady is called Ellen Bluumenstein, named as same as the new curator but with extra one “u”. She is an avatar created by Sabine Reinfeld and Ulf Aminde. Not only online but performing also in a real world misleading some people to think this avatar is the curator. The avatar with uncertain meaning of action directs questions at the curator’s role and influence to the art scene. With many misunderstanding, their artwork has definitely impressed the new curator’s inauguration. Along with those artworks to liven up the start of “RELAUNCH,” KW also worked out the changes to the design of its website, print media and displays. Among those, the biggest feature is making event spaces for the new programs by remodeling the building. The building of the museum is now separately used, 1F&2F for the art exhibitions and 3F&4F for architecture, music and literature events. This enables the events to be organized at the same time with the exhibitions and involve more participants in the museum. The creation of this event hall tells us KW is trying to cross the different sectors of art. Some examples are collaboration events with the festivals “Foreign Affairs” and “Arsenal,” presentations of movie & video art. 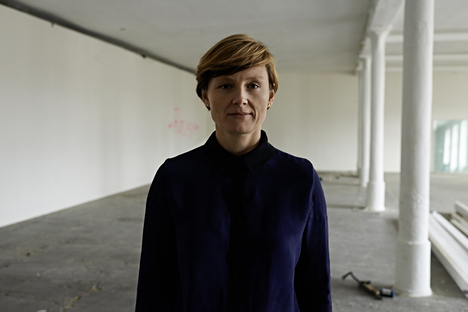 Also KW is talking with Deutsches Hygiene-Museum, an architecture magazine and sound art organization, for future plans. But let alone the provocative exhibition, it is a fact that the reform of KW has caused much confusion. People find it difficult to grasp the whole picture of the exhibition because of the overwhelming increase of events and exhibitions. In Berlin, heaps of cross-boundary events are organized everyday in the first place, so it cannot be “very new” even though one tries to reflect on Berlin’s characteristics. Then what is the aim of the re-born KW? What answers this question is “REPAIR. 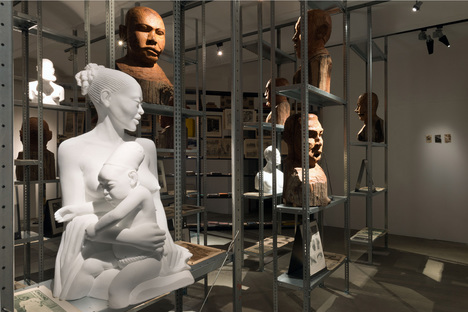 5 ACTS,” one of the “RELAUNCH” exhibitions, by Kader Attia, a French artist. 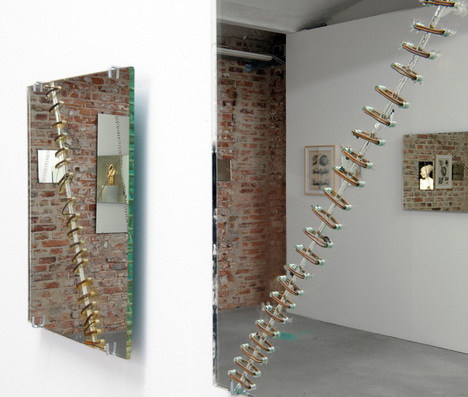 Kader was widely noticed at the worldwide exhibition “Documenta” in 2012. As the title of the exhibition shows, displayed sculptures and materials have the theme of “repair.” The exhibition hall is full of wood carvings of hurt and skewed faces, and pictures of injured soldiers fill the wall. And the history of colonial rule is shown also with ethnological materials. The scars expressed in those artworks make the viewers recall all sorts of violence. However, jointed, broken mirrors displayed in the hall imply that things still can be used even with the scars. It also makes us think about the meaning of “repair,” through building new relationships between the colonial ruler and the ruled country, even though they have the scars of history. The important message here is “restoration” by connecting the separated parts. 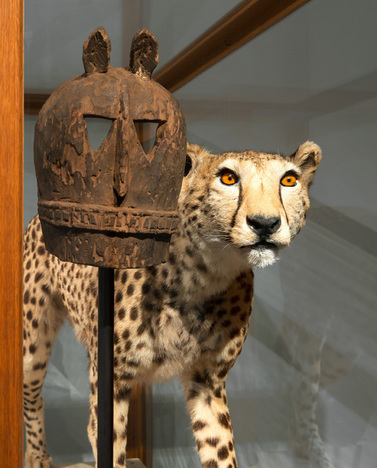 Kader Attia talked about the “restoration” shown in “REPAIR.5ACTS” during the interview. The “Repair” he deals with is a kind of “restructuring” of a continuing process, a step for the future. His “repair” as reconstruction arouses a response with KW’s new direction. Both of them are crossing the art sectors to “repair” the joints at the closed-off parts, which encourage people to reconsider art. It will lead people not only to crossing the art sectors, but also to ask questions about the suspicion for the existence of art institution KW, which presents insubstantial exhibition : “What should a museum show to the people?” or the suspicion for curator role caused by an avatar curator in this exhibition: “What role will the curator play in the art scene?.” The “repair” and “restructuring” by KW is a challenge of complete innovation to the museum, curator and art itself. The chaos of KW’s relaunch will definitely take Berlin’s art to new stage.